Derry City's new signings Ciaran Coll, Peter Cherrie, Ally Gilchrist and Jamie McDonagh. 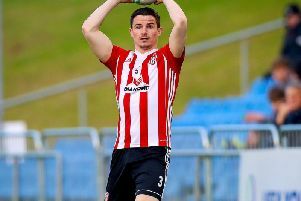 DERRY CITY have secured Peter Cherrie, Ciaran Coll and Ally Gilchrist on one year deals, while Jamie McDonagh has re-signed for the 2019 season. Former Dundalk and Cork City goalkeeper Peter Cherrie will be the Candy Stripes new number one, as boss Declan Devine confirmed that long term servant Gerard Doherty, has left the club, with Danske Bank Premiership champions Crusaders believed to be his next club. Defenders Coll and Gilchrist will boost the small City squad, while the news of McDonagh re-signing will please the Brandywell faithful. Coll, who only celebrated 10 years with Derry's near neighbours Finn Harps, can play in either left back or centre-half, while Scottish central defender Gilchrist joins after having a disappointing time with Shamrock Rovers. The 23-year-old joined the Tallaght side after leaving St Johnstone in December 2017 following six-and-a-half years at the Scottish club, where he made his first start for the Saints in their Europa League tie against Lithuanian side FK Trakai. The Edinburgh man has developed in loan spells in Scotland’s lower leagues, firstly with Elgin City and then with Peterhead, helping the latter to the League One Playoffs and playing against Rangers at Hampden Park in the 2016 Challenge Cup final. Devine also confirmed that he hopes to add a few more additions to his side later this week.